Your eyes will never look better once you try our moisture enriched firming eye creme. Lines and furrows seem to dissappear thanks to the soothing natural blend of Alaska's most treasured extracts. 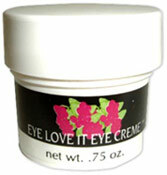 Recommendation: Apply moderate amount around the eye under moisturizer or alone. Use morning and night.